There is this one obsession to overcome the fear and almost everyone tries almost their whole life to overcome it one day or another. Same is my case. And this is one of my reasons for joining BTC. Before you start reading, I thank Anthony for Okaying my self proclaimed I-WILL-WRITE-BLOG-THIS-TIME thing and all the guys who really expected this particular blog post will be RAMAYAN kind of lengthy. I am sure I didn’t let you down. So here goes my experience trekking with BTC for third time with the drooling and hot topics “self-cut” edition. The trek to the “so called HoneyHill” was so exciting right from the time I have googled it for its altitude. It was about 1.2 kms ; just 7kms more to train myself to reach Himalayan peak’s heights. 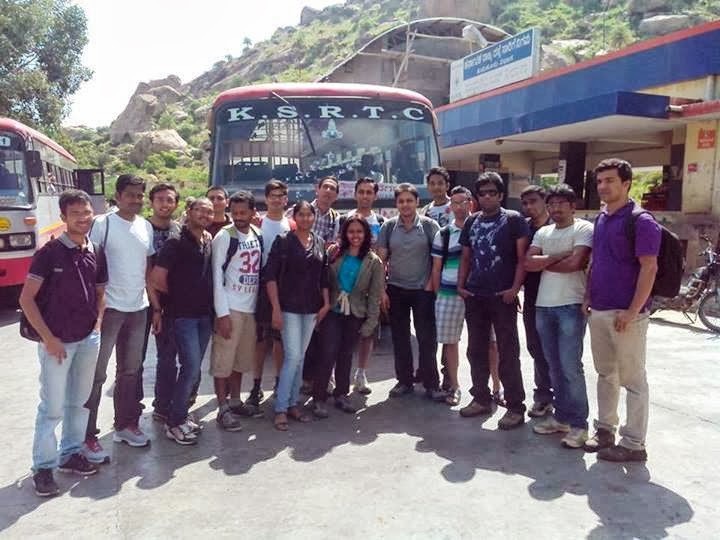 We were a team of 20 enthusiastic trekkers lead by Anthony from the front and Santhosh from behind. The plan was to assemble at KSRTC bus stand near Hopcoms stall ; opp. To Canara Bank ATM which is beside Nandini Milk parlour (God knows which Nandini milk parlour as the entire bus stand had tens of stalls) by 6:30 AM and start by 6: 45 AM but we started the journey at 7:10 AM . We (not me) had tea and few bought fruits, cakes and chocolates which we shared among everyone throughout our trek. I tried to offer cake to the conductor or if not to deepthy, but this was meant to be my DOUBLE REJECTION moment and I felt good though as the cake was still left. It was a 120 kms journey and it was almost 10: 30 AM as we reached Madhugiri. We ordered masala dosas, set dosas, idli’s (I got 3 idli’s in a plate on special request :P) and packed Lemon rice and set dosa’s for lunch. Now that we were energized, we had our literal “ROUND ROBBIN” introduction session at the mountain’s base; came to know there were just two “freshers” in the group, everyone else just acted as if they were just awesome trekkers until the mountain trolled on us. Sumit, Varun were climbing up the hill as if the fort above was calling them. 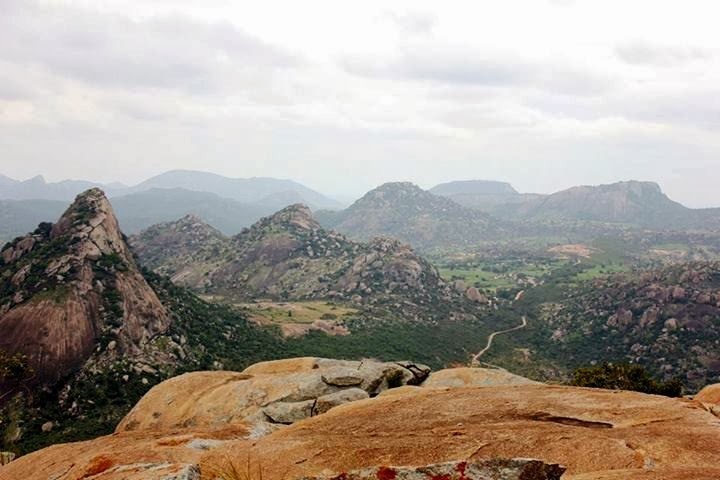 Manasa in the meanwhile climbed the entire mountain barefoot (btw she was a fresher). Santhosh and deepthy, they were stunning my eyes with their teamwork. This was actually the first time I came to know about team work, co-ordination and hard work. As I climbed up struggling and gasping for my lost breath, I realized deepthy was stuck at a place where she could not return back nor go up. Finally with Sumit and Santhosh’s help, they reached to a safer contour. Santhosh, Anthony were just climbing as if it was a cake walk for them. I could find almost everyone them gasping for breath. Their words kept draining my energy as I climbed till the top. Am sure everyone felt the same. The ECHOic pond in our way, few off-track small scale explorations went on in our way with loads of snaps taken until we reached the GROUND ZERO. 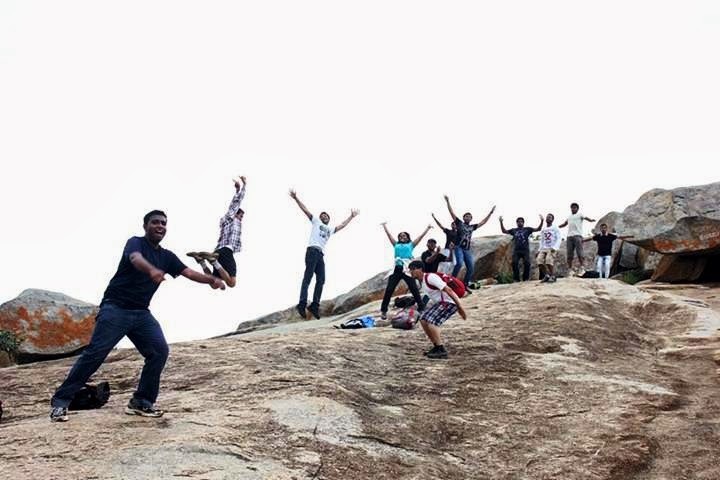 Everyone then started climbing over the wall to the end of the cliff and sat above where they posed for pictures, spent time as the cool breezes showed their effect reminding us of why NATURE is called the BEST DOCTOR..
We reached the peak by 1:45 PM. There was pomegranate and apples cut and placed for eating and everyone had their MONSTROUS hand at it and then we had our lunch by 2: 30 PM. Anthony’s wanted us to reach the base by 4: 30 PM or at max. 5: 00 PM. But then Raghav, Gowtham, Mallesh, Raja found out a “secret hole” of about 6 feet deep where, as Anthony says, they stored gun powder but we found stones instead. Raja went into this secret hole at around 2: 53 PM, then everyone started getting into that and there were two persons to pull the person back. 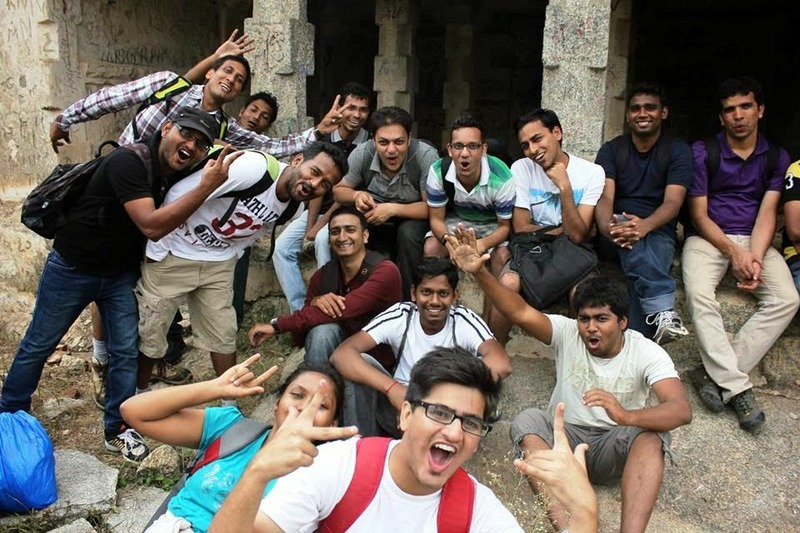 There was also a cave where we picked up lots of snaps and in all these pics, Santhosh’s funny poses are common. Anthony still took time to explain what DSLR camera is (its full form to start with which is Digital SLR) and how it should be handled. At 3:20 PM sharp we started descending up and it was quite easy when compared to the ascending part. Anthony explained why there were treacherous metal wires over the rails because of which people stopped sliding down. Else they would have seen GOD atleast once on their way down. Raghav volunteered carrying all the plastic waste despite lots of hardships he faced as he climbed. We then descended by almost 4 : 15 PM and as we reached the ground level ..
we explored a very old madhugiri taluk prison. Tried few instances of how LIFE OF A PRISONER would be. 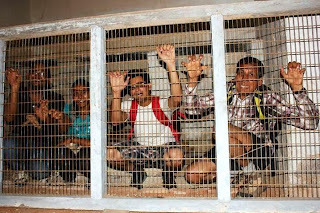 Santhosh, myself, Raja were guilty of our crimes committed “whatsoever” and deepthy claimed herself to be a happy prisoner. Out of all, I was too happy as I got my share of cone ice cream in the bus which began at 5: 30 PM to bangalore. We reached to majestic at around 8: 00 PM. Our engine( Anthony) and many others ( bhogies) left us (left over bhogies) on the way. And there ended our another happiest days exploring the nature. The entire trek experience was stupendously fantabulous and I hope everyone had their muscles and abs open up. Thank you for bearing all ALONG with me :D and if you liked this blog kindly slap yourself because blog are meant for blogging and not for writing epics like RAMAYAN and MAHABHARAT. Its an EPIC that I blogged. See you in my next trek guys !! Adios! I was woken up by this guy who offered me cake, (very obvious he wanted to disturb our sleeps), anyway he was kind enough to offer all of us "dairy milk prasad" (Mallesh was looking for a good resolution microscope to check what was given to him, the prasad was that tiny!) 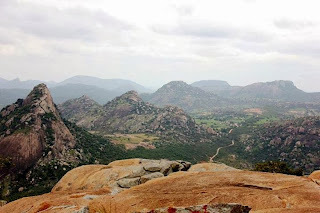 By 10.30 we reached Madhugiri, damn the day was soooo hot and humid. We were all hungry and went to a hotel for our breakfast. Everybody had a great breakfast, it was really yum! (I presume Naresh was the only one who didnt eat much, as his half Dosa was gobbled up by Aditya). We also took our lunch parcels. We reached the entrance of the fort, and had our introduction session. 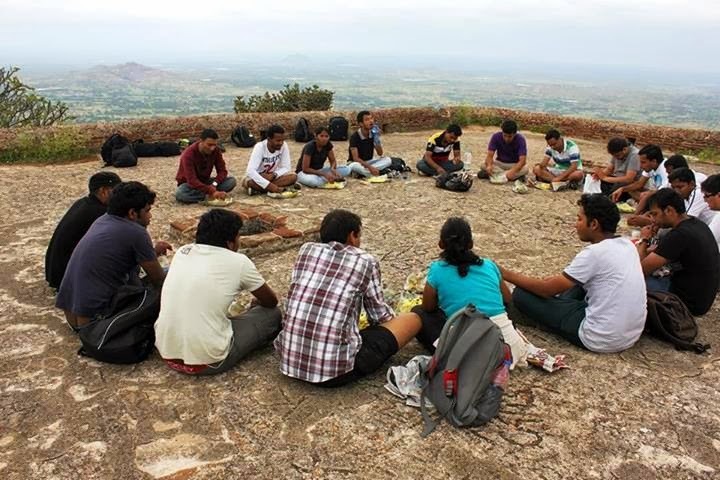 Only two guys were first timers (Manasa and Raghvendra, must applaude Manasa who trekked barefooted). Every trek has to begin with a photoshoot! We began climbing the initial steps by 11.30, which was neat and made us feel that its 'do'able. I can't say if love was in the air, but it was definitely on the rocks! beginning with romantic lines and as we went up, the post 'break up' lines from the "majnu", our talks became confined to these love stories, just guessing what might have happened there! After about 300 mtrs, we found a huge reservoir, the clear water inside it was just inviting us to take a dip. Raja and I couldn't resist, stepped in, to feel the cool water caress our feet. With cheerful smiles on our faces, (not knowing that worse is yet to come) we ascended through many gates, clicked pics at all the corners. 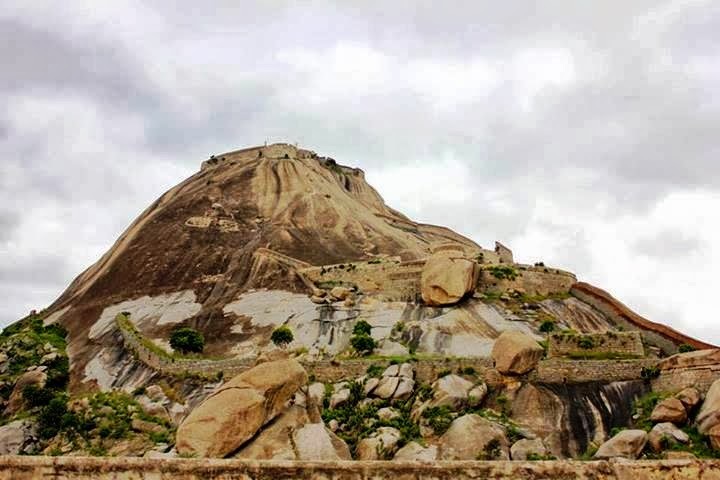 Then came the actual scary Madhugiri monolith [Its named 'Madhu'giri (Honey hills) really? It seemed like sweet poison]. There are iron railing upto the top to help you climb, even then it was the toughest to do. Santhosh convinced me to trek with him besides the railing and i happily went along, i was almost running over the hill with him and soon it got steeper. I was literally stuck at a point where i was neither close to the flat landing nor to the railing. Oh God! my heart beats faster even when i try to recollect that moment. It was almost like 'the end'. I really don't knw how i got out of it, all i remember is Sumit offering me carrots to eat while i was trying to get in touch with reality, i had gone that pale and blank. It didn't end there, we had more such steep distance to cover. I said thanks and bye to Santosh for the last moment experience, and didn't risk to do that action again with him, so took the railing support to climb. We were literally at 90 degrees to the hill while trekking. We entered a gate which seemed like we reached the top, no! it wasn't the top. All the gates kept tricking us, we had more to ascend everytime we passed these nasty gates which let us enter through them with a feel that we reached the top. It was worth watching and capturing everybody's facial expression when they entered the gate thinking it was the end! Varun captured us throughout and Anthony clicked snaps with 'self timer', it was one of his invention to click great pics apart from his useful tips to use a DSLR camera :) By 3ish we all began our descent, which continued with lot of laughters. We reached the base by 4.30. 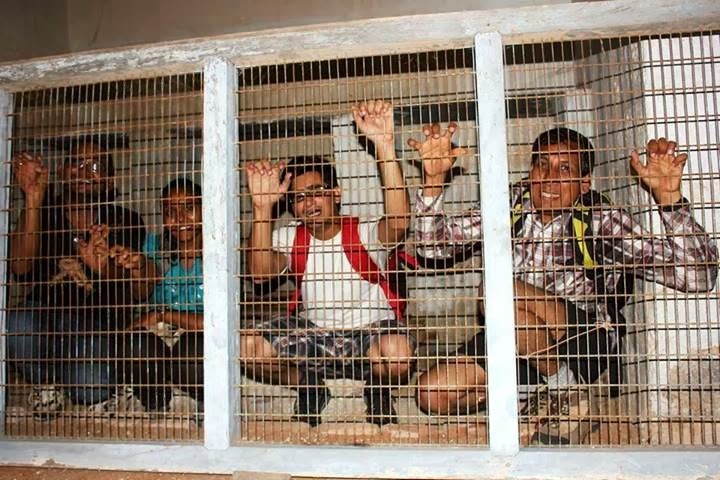 As we roamed around we found old prison cells, all the self claimed criminals went behind the bars to pose for clicks! while Vaibhav was down his memory lanes, he told us that these cells reminded him of his classrooms in his school :-P (Schools does seem like prisons for kids!) We had more photo sessions and then walked to the bus stand, boarded a bus to Bangalore. Anthony made the trek even sweeter by giving us ice cream cones. Like the last benchers in classrooms some BTCians who were last seaters were dozing off throughout the journey.